1. a point at which a decisive change takes place; critical point; crisis. During the past two summers, I worked as a residential counselor for the Boston Ballet‘s Summer Dance Program. I was like a camp counselor/resident assistant/mom/older sister to teenage girls who had traveled from across the country and the globe to study for five weeks with the Boston Ballet. These are dedicated students, many of whom have dreams of becoming a prima ballerina in a company. During the program, they dance for 5-6 hours every day, five days a week for five weeks. Because of the intense schedule, several students are sent home over the course of the summer to nurse injuries, both old and new, aggravated or caused by hours of dancing or unfortunate falls. Yesterday, one of the students I got to know during those two summers had hip surgery. Just a few years out of high school, and she’s having hip surgery. Soon after setting the date with her surgeon, she shared on Facebook that the procedure would fix her constant pain, but in exchange she would probably have to give up dancing. Her doctor said others have been able to return to dancing after surgery before, but he cannot say for certain that she won’t need surgery again. “I’m pretty sure the door is closing on a professional career,” she said. Though terribly disappointed, she fortunately has the willingness to consider other options and form a Plan B. Other students I’ve seen are so blinded by the chance at a role or a career that they become determined to dance through pain and injury at the risk of further damage to their bodies. Every summer, I’ve posed this question to my students: if you couldn’t dance, what would you do? For some students, I think it may have been the first time they ever thought about it. In A Chorus Line, a musical about a group of dancers auditioning for a new stage production, the characters face the same question. (SPOILER ALERT!) After one of the dancers falls and is taken to the hospital, the director Zach (played by a young Michael Douglas in the ’80s movie version) asks, “Do you ever think about what you’re going to do if you stop dancing?” In the movie, Connie says she’ll go off her diet. Sheila talks about how she and Zach appeared in the chorus together many years ago (“You were a rotten dancer” – “Why do you think I became a choreographer?”) and how she now has a 9-year-old daughter. Sheila: God help her, she wants to be a dancer. Diana: What’s so wrong about that? How can anybody in their right minds want to be anything else? In the stage version, Diana answers with “What I Did for Love,” singing about how she wouldn’t regret the sacrifice she made for dancing, but at the same time is ready to move forward. When I see these dancers go home from the summer program or into the operating room, I wonder what things would have been like had I continued dancing. I was 3 when I took my first dance class, but my family moved to a new state the next year; I didn’t take class again until 2nd grade. At first I took the ballet/tap/jazz combination class that introduced kids to the different styles of dance. When I got older, I focused solely on ballet. At the end of 6th grade, I felt like I wasn’t growing as a dancer. That fall I was at a new studio learning terminology and the importance of turnout and pointing my toes, things I didn’t realize until then were fundamental to ballet. After a boot camp of a year, I was able to move to the advanced class. I shared a barre with the school’s best dancers – the girls on pointe who took home trophies from competitions. I hoped to be one of them someday. To my excitement, my teacher had me fitted for pointe shoes at the end of the year, and she gave me exercises to do over the summer to prepare for class in the fall. As the end of the summer approached, I received the usual class registration forms in the mail. I was excited to see I had been invited to join the new repertory company my studio director was forming – until I saw all the requirements: weekend company rehearsals, regular class during the week, and extra classes for company members. It was a bit much, especially during my first year of high school. I was worried I wouldn’t be able to handle it all and hoped my director would let me take class without joining the company. All or nothing, she told me. I went with nothing. “Are you sure?” she asked. I was feeling pretty confident in my decision to focus on my academic success, but she told me that somewhere “down the road” (I remember her using that specific phrase) I would regret it. I was 14 years old – the same age as the youngest dancers in the Boston program. Looking back on my high school experience, I probably could have handled the academics as well as the dance training and membership in the company. What if I had chosen all instead of nothing? Could that decision have changed the course of my life? Would I have attended summer intensive programs around the country? Would I have had dreams of a professional career in ballet? Would I be having surgery in my early 20s? Would I have ended up where I am today if I had continued dancing? Though I stopped training at that point, I never stopped loving dance. After 5 years without ballet, I joined the dance ministry at my college, took a year of ballet, and even performed in the year-end recital. Last year I started taking ballet and jazz classes at a local studio, where some of the other students in my class were also in their 20s – or older! Over the summer, I talked with my teacher about dancing en pointe, and this fall I dug my pointe shoes out of the closet. Now almost 10 years old, they still were not broken in or worn out. (Hopefully it’s okay to be using shoes that are so old, though my feet haven’t grown since then…) I’m excited to be on pointe – finally! – but at the same time somewhat terrified. It’s been a while since I seriously studied dance; I am not in my physical prime. Since then I’ve lost stamina and flexibility; I’ve gained weight. 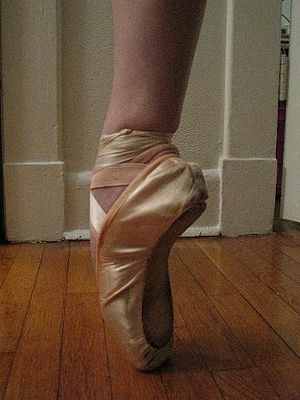 Sometimes I think I’m too old to be starting pointe – I might break something! But now that I’m “down the road” I think I can say I don’t regret leaving dance for all those years. Though I may wonder where life may have taken me had I continued dancing, I enjoy where it has taken me so far. I love the place dance has in my life right now, as something to appreciate and enjoy doing, not demanding my perfection. So while I don’t regret leaving dance before, I’m glad I had the option to return. Do you have a turning point, a moment or decision that possibly changed the course of your life? Good post. Much to think about! I have six daughters – four currently take ballet and two are company members. The oldest in ballet is 13 almost 14, and we are very close to making the decisions about which you write- whether to go away for a summer intensive next summer or not. This coming summer it is easy enough to stick with the local intensive-but what is down the line? Is dance worth the great stress on the feet? Risking injury or malformation? It doesn’t always happen but it is a distinct possibility. Dance must either be done entirely or not done at all. My 13 year old currently dances five days a week- two to four hours a day in preparation for spring ballet-We are always at the studio; everything is considered in light of dance- schedule, food, dress…. And then to consider there is the wonderful advantage and blessings that dance brings- the movement- the result of grace and fluidity, self-awareness, confidence, poise, exposure to beautiful music, graceful movement, focus on great things…. Thank you for this post. Again – much to think about. :) It sounds like you have found just the right balance — pun totally intended ! Thanks so much for your comment! It is a difficult decision, but one that I’ve learned after all these years is not set in stone. Hopefully your daughters will be able to determine if they love ballet enough to make all the sacrifices that come with pursuing it intensely. And hopefully they will never lose the love for the art, even if they choose a different track for their professional lives. Often, the experience of summer intensive programs can help students decide if they truly want to pursue a professional career in dance. However, injuries and accidents are far less predictable. I think my time away from dance helped me realize how much I do love ballet, and the low-pressure environment of my current studio really facilitates the enjoyment of the art. We do not participate in competitions, so there is less focus on endless hours of stress to perfect ourselves. We are able to enjoy the blessings you mention, and since we are a Christian studio, we are able to view dance as a means of worship rather than just performance. Beautiful- thank you :) Yes, the experience of a summer intensive will probably reveal much- I’ve marked your blog on my ‘favorites’ and am looking forward to more posts- my daughter is an art/English major in college and all the girls also play piano and sing- so you have a kindred spirit in us :) God bless- T.